I signed up recently for a CSA box, mostly because I'm too lazy to get up and to to the farmers' market on weekend mornings! I got one that I can customize from farmfreshtoyou.com, but this week I forgot to click "save" after I made my changes. Oops! That meant a third box in a row with a giant head of broccoli. I promised a coworker that I'd give it to her if I didn't get it cooked this weekend--sorry, Alicia, but I found the time! Now, I do love broccoli. It's just that it's hard to feel inspired by it, and it really needs to be prepared correctly, which means some careful peeling I don't always want to do at the beginning of the semester. With the first bunch, I tried making a chicken and broccoli casserole, which felt like cooking a foreign dish since I'm not from a family that makes a lot of casseroles. It was OK, but not terribly exciting. Roasting it seemed like a much more modern take on the classic veggie. 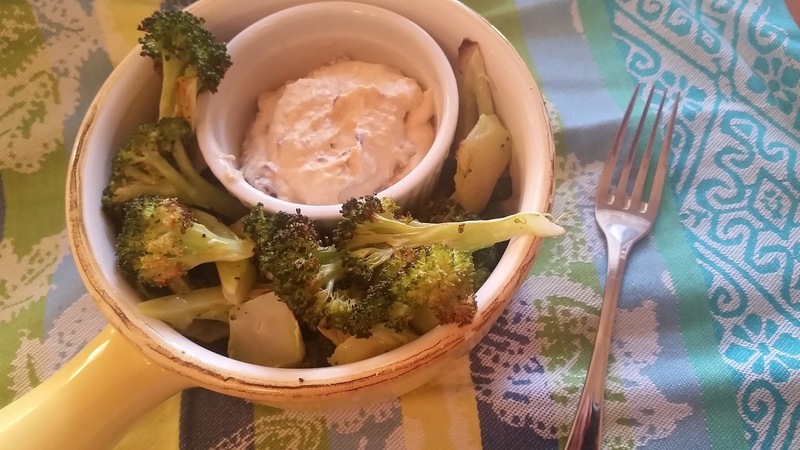 You can use florets, but if you get whole broccoli, be sure to use the stem as well as the top. Slice the florets of 1 1/2 lbs broccoli into even sized pieces, 1/3 to 1/2 inch wide. They won't all be even, but get them as close as you can. Remove the tough peel from the outside of the stem AND from the sliced florets. 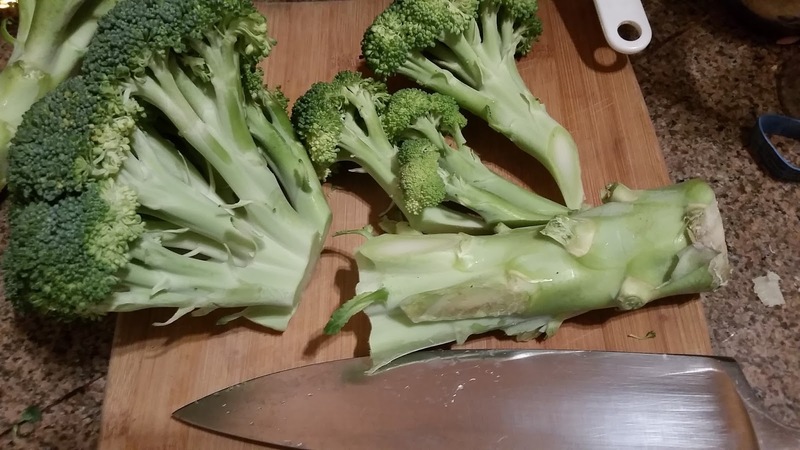 You'll need a paring knife or a good sharp peeler to peel the stem. 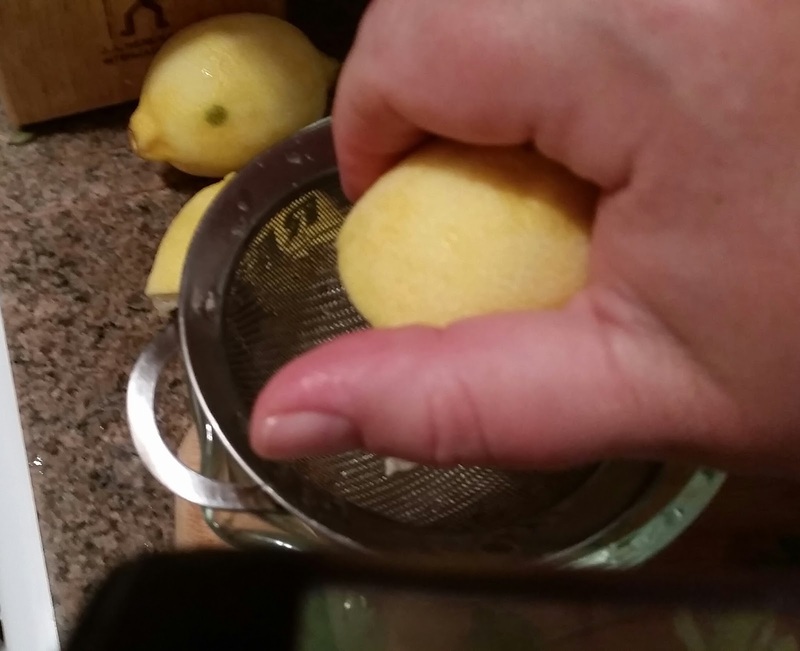 You can peel with your fingers from the bottom of the floret slices or use a paring knife again. 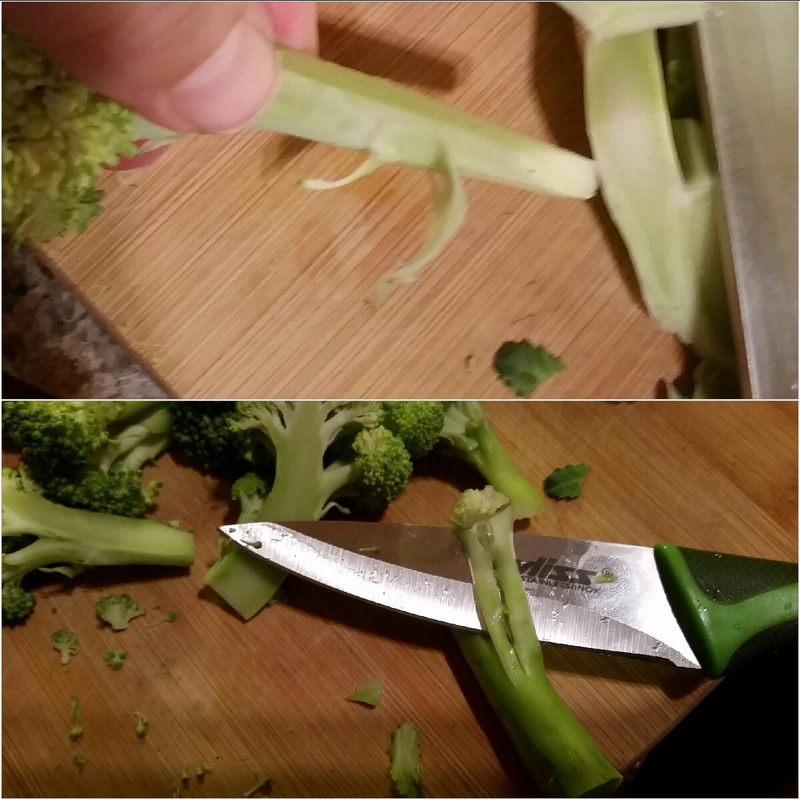 Slice the stem into sizes about the same thickness as the others, or a smidge thinner. 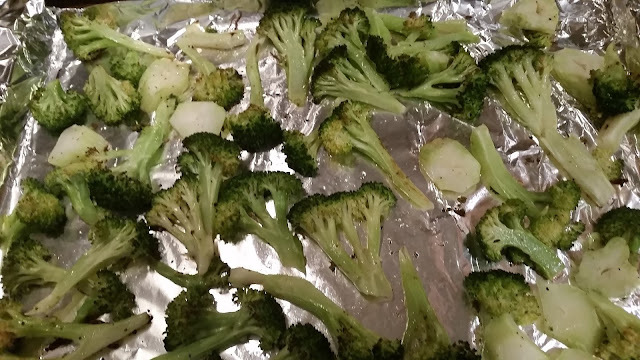 Cover a baking sheet (or two) with parchment or aluminum foil and pile the broccoli in the center. 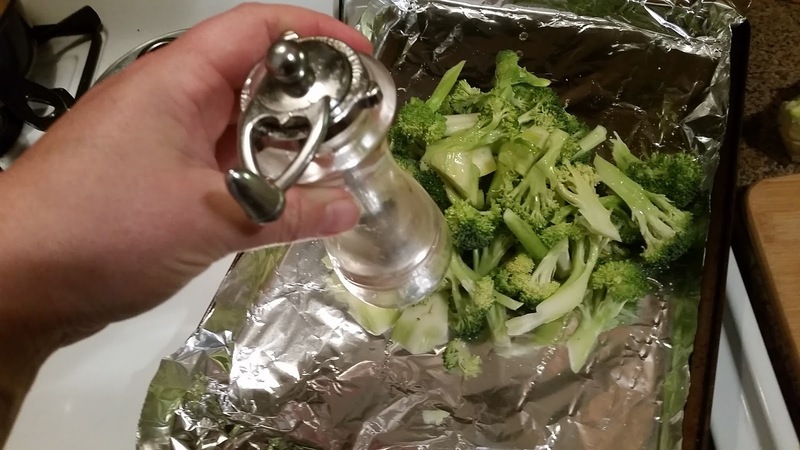 Drizzle the olive oil and seasonings over the broccoli and toss them for a minute with your (clean) hands. Spread them out evenly on the pan. 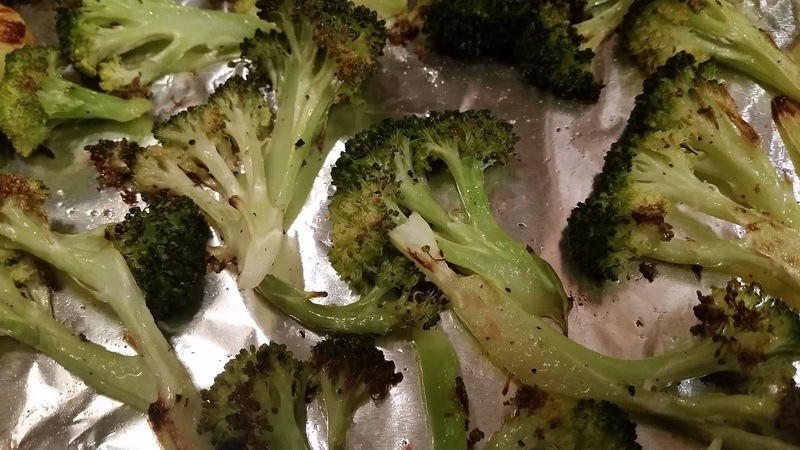 Pop them in the 450 oven and set a timer for 7 minutes. After 7 minutes, pull them out and flip the pieces over. A pair of tongs will work better than a spatula, but the spatula will work if that's all you've got. At halfway, some pieces will be browning and others will be blackening. You can taste a piece to see if it needs salt. Pop them back into the oven for another 7 or 8 minutes. 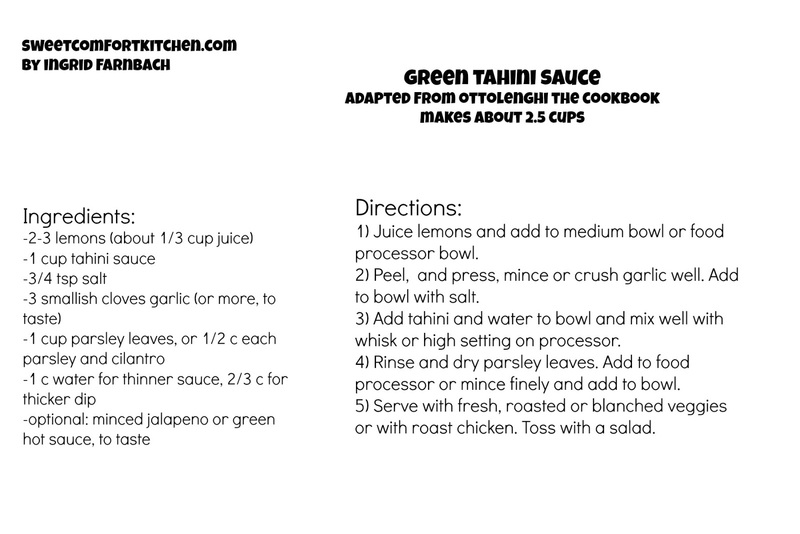 Take them out and serve with Green Tahini Sauce or just lemon and butter. 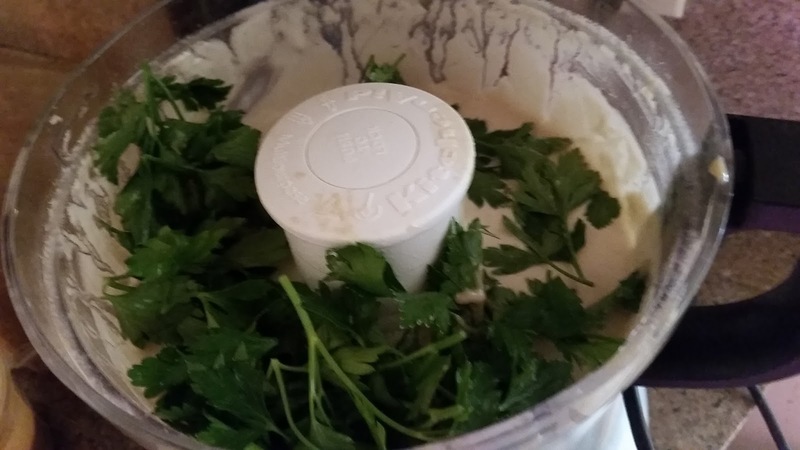 I made some hummus with Kalamatas today, so that's how I served them this time. When last semester ended, I had visions of a very productive summer off from teaching. What happened instead was a lot of rest and binge watching...it turned out that what I really needed was to just be for a while. I got in a little sun time, a few swims, and some wonderful time with friends. The closets are still overstuffed and in need of reorganization, but my soul is healed from the past few years of intense work stress. Despite being something that usually re-centers me the blog, like the closets, didn't see much action. I mean, there are four seasons of Vikings on Amazon Prime, y'all! 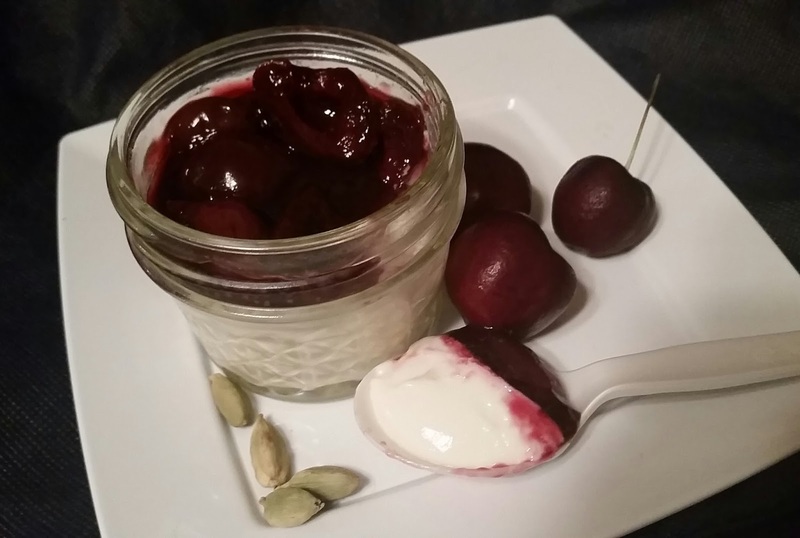 But I've been tinkering with some panna cotta ideas, and here is the result! Panna cotta means cooked cream in Italian, and it's really quite a simple process. Warm the cream with vanilla or another flavoring, stir in sugar or honey, dissolve some gelatin, and let cool for two to four hours. When I started imagining how I wanted this to come out, I thought some lovely apricots would be a great foil for the cardamom. Then, I went to the store and tasted one of the delicious end of season cherries, and my plans changed. To mold a panna cotta, the traditional way is to use a ramekin and flip it out onto a plate once it has set up. If you want to do it that way you might do the cherry part first and let that set up before doing the cream part, or save the cherry part and make it just before serving. 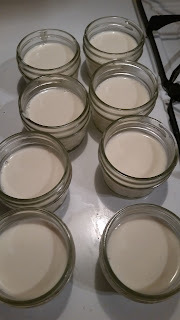 I'm presenting these in 4 oz Mason jars instead so I can take them to a picnic...it also worked well for taking extra test servings to work so I wouldn't eat them all myself! 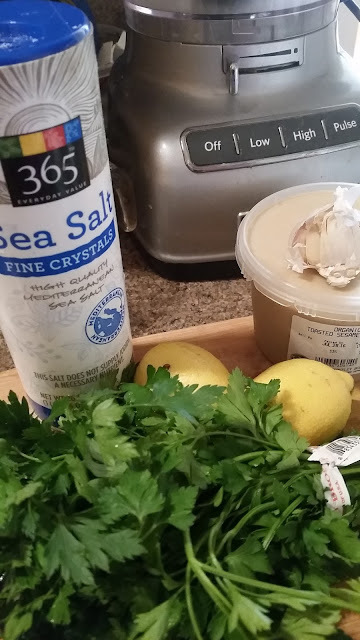 Because there are so few ingredients, it's important to get the best ingredients you can. It'll make a big difference. I went with half and half in the end, but have also made this with all heavy cream and with one cup each of cream and half and half. It all works. 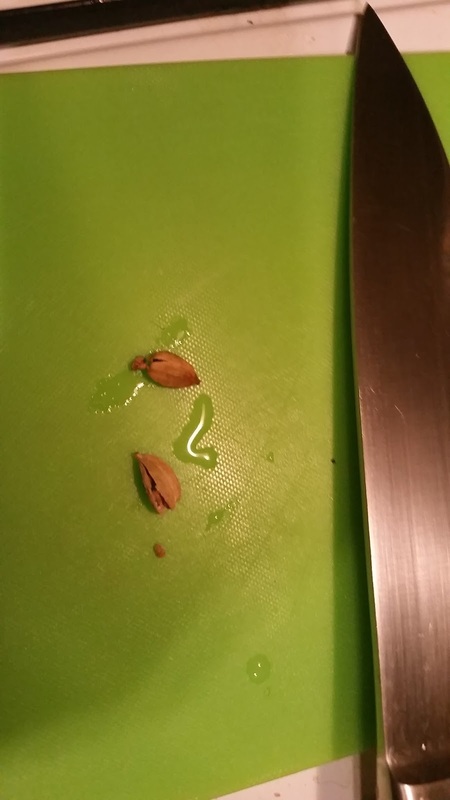 Gently smash 2 cardamom pods just so that they crack and the cream can get inside them. No need to crush or grind them. 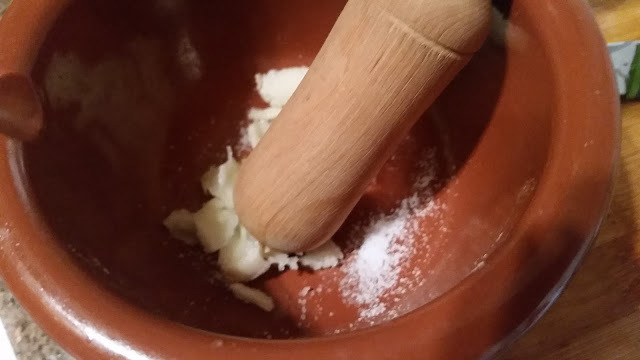 You could add a teeny bit of ground cardamom if you don't have pods, or if you prefer, you can add 1/2 a vanilla bean instead, or 1 tsp of vanilla extract. I've even seen a recent recipe using bay leaves from the lovely and talented Chris Cosentino...might have to try that one some time. In a heavy pan, gently warm 2 cups half and half or heavy cream with the two cardamom pods. 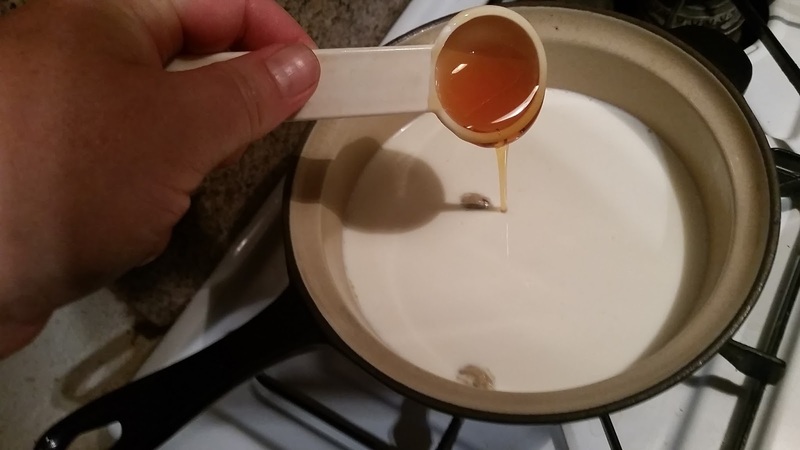 As it warms up, stir in 3 Tbsp honey. Heat it until it's very warm but not simmering--if it starts to bubble, take it off the heat right away. Let it sit and absorb the cardamom flavor while you soften the gelatin. 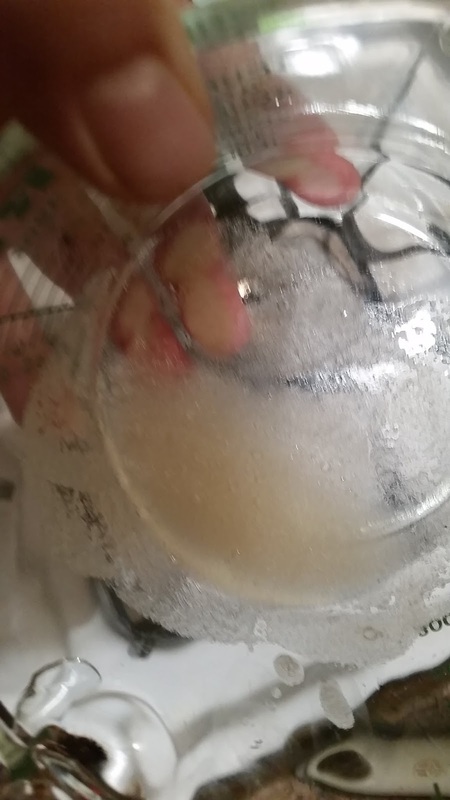 Sprinkle 1 pkt powdered gelatin over 2 Tbsp cold water. Let soften for 5-10 minutes. Strain the cardamom pods out of the cream and pour the very warm cream over the gelatin, stirring vigorously to dissolve completely, 1-3 minutes. It should smell really good by now! 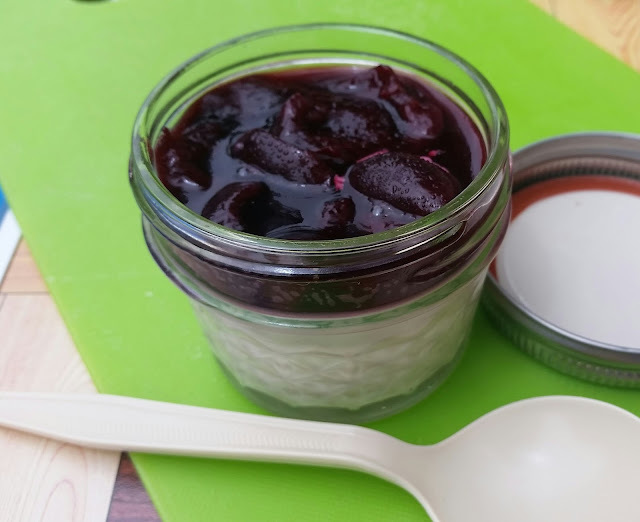 Now set out the ramekins, Mason jars or glasses you'll be using to mold the desserts. Lightly oil the ramekins or Mason jars with a flavorless oil. Avocado oil is becoming more affordable (at Costco and Trader Joe's) so it's now in my cabinet. Let's hope it's as good for you as they say! I put a drop or two of oil into each jar and rub it around with a paper towel. Using a strainer to remove the cardamom pods, pour the cream mixture into the jars or ramekins. 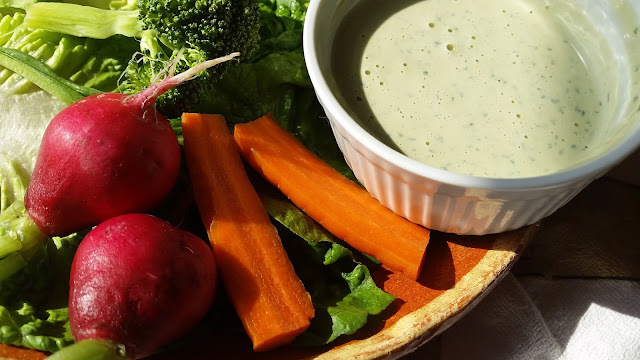 Set the panna cotta in the fridge for at least two hours before topping or eating. And now, the cherries...you can start them after the panna cotta have been chilling for 90 minutes. You can, of course, top the panna cotta with plain fresh fruit in season. What could be better? But if you'd like a presentation with two layers, all you need are these few things. 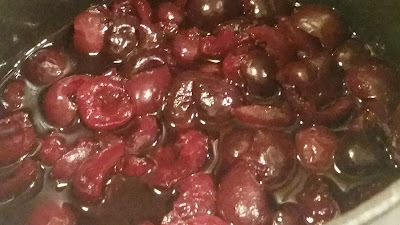 Frozen cherries would be perfectly fine out of season, and if the ugly-but-tasty fruit is cheaper than the perfect looking cherries, this could save you a little money. The supermodel cherries were $5.95 a pound, and these delicious but bumpy little guys were $2.79. 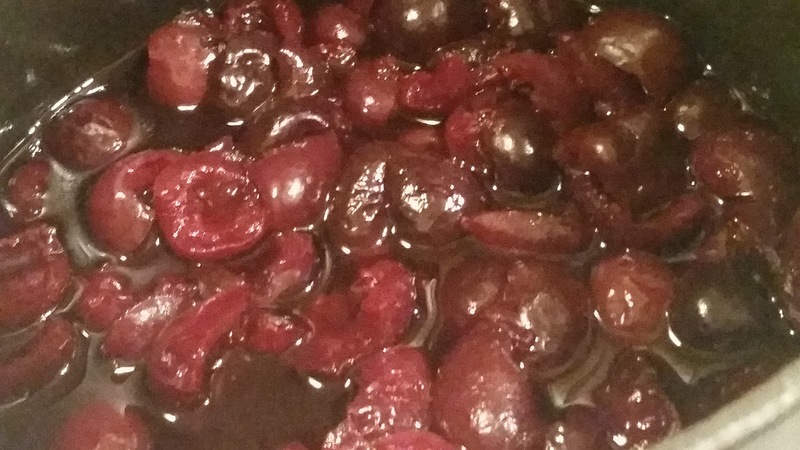 Remove the stems and pits from about 3/4 lb fresh cherries or 1 pkg frozen cherries. This cherry pitter thingamajig you see below is one of very few unitasking tools in my kitchen. I bought it thinking it would also pit olives as advertised, but it only works for certain varieties of those. Ah well, at least it doesn't take up too much space. 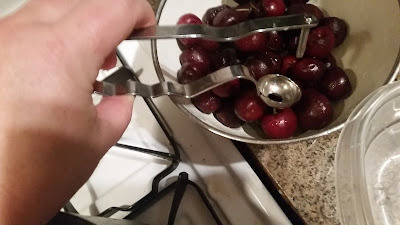 Put the piercy thing through the place you removed the stem from, and split each cherry in half to make sure you've actually gotten the pit out. Every now and then there's one hiding up in there. 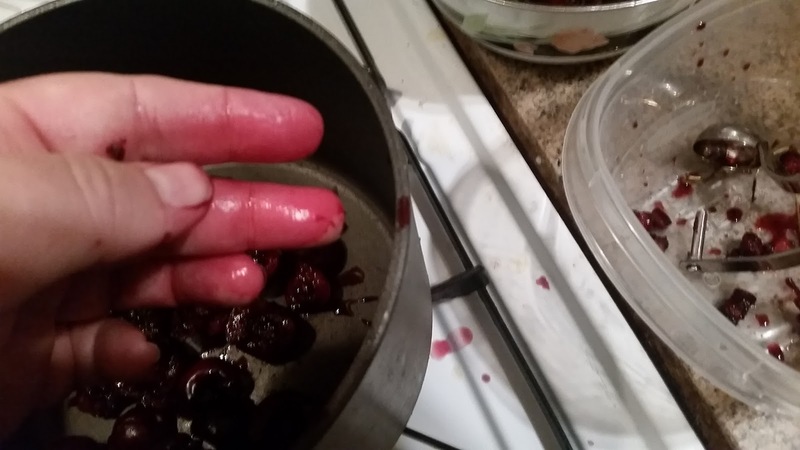 Yup, pitting cherries is messy. Wearing an apron or something that's already deep red in color is highly recommended! 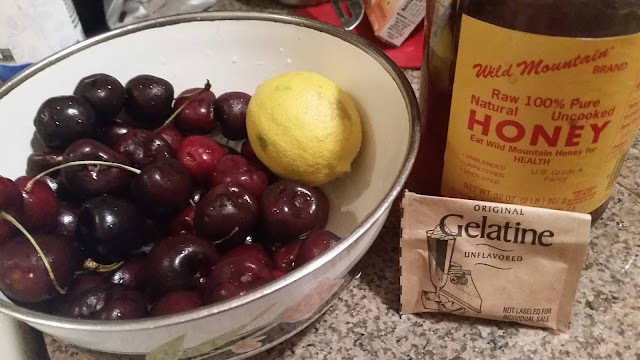 Add the pitted cherries to a non-aluminum pan with juice of 1 lemon, 2 Tbsp water and 1 Tbsp honey or sugar. Simmer for about 20 minutes. Remove from heat and cover. If you're serving on plates, you can just put these on as is. 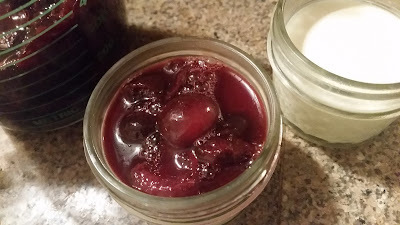 If you're transporting them in jars or making a bottom layer in ramekins that'll be the top layer when you flip them out, let 1 tsp gelatin soften in 1 tbsp cold water for 5-10 minutes and then stir in the very warm cherries. The gelatin is just enough to set up the juice and keep everything nice and neat, or if on the bottom will set up when chilled so it doesn't mix in with the cream. 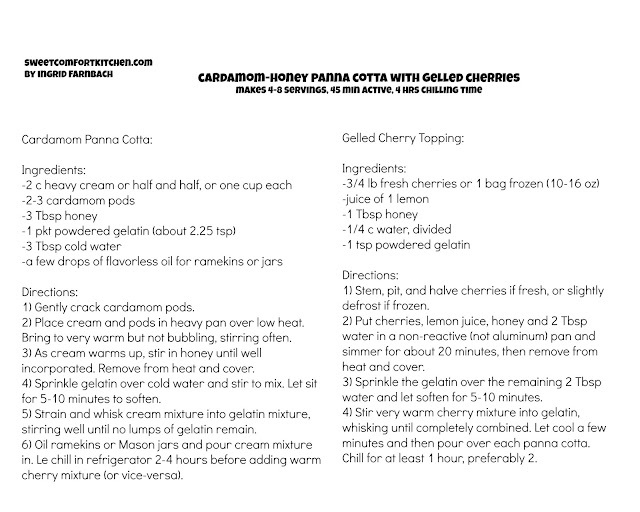 Once the panna cotta has set quite a bit (almost 2 hours), ladle even amounts of the cherries over the cream. Don't worry if there are bubbles. 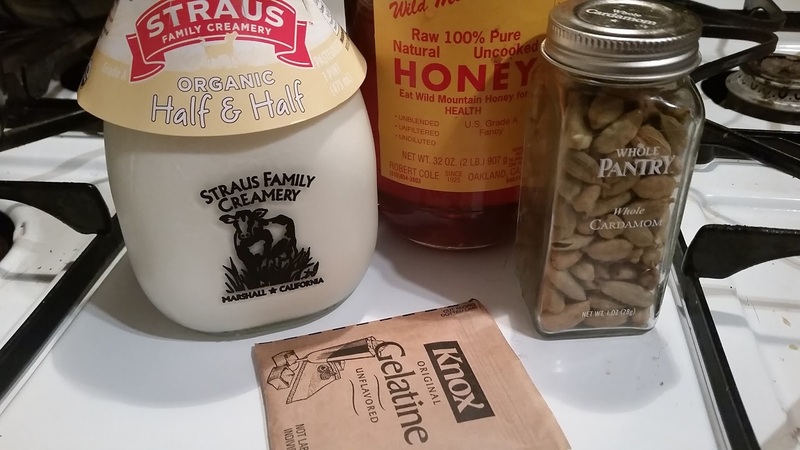 Return the jars to the fridge and let set for at least one more hour or overnight. BTW, if you transport these somewhere, keep them cool. The gelatin will melt in the sun. The good news is that it'll set right back up in the fridge, but not in the pretty layers.